The Knitting Pirate » In Which the Pirate Swears She's Done Now. « In Which the Pirate is Frustrated. In Which the Pirate Swears She's Done Now. Pirate-Husband laughed at me when I said "After this, I'm not going to buy any more yarn until MD Sheep and Wool in May." Can I really go nine months without buying any yarn? We shall see - but that's my plan! But this was a special case (aren't they all?) 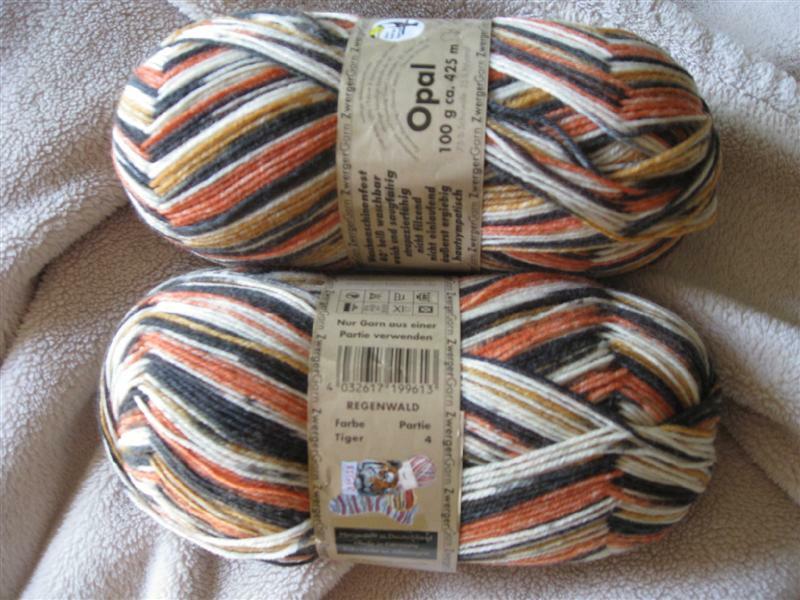 This is Opal Rainforest yarn in the discontinued and hard-to-find Tiger colorway, and I've been looking for two skeins of it for over a year so that I can make matching tiger paw socks for both of us. I finally found some through an Australian Raveler who was kind enough to ship overseas for me! My favorite animal is the mountain lion, but Pirate-Husband likes tigers better, and so I thought it would be perfect to make him socks like these. Here is a link to the original project on Ravelry. I think they're adorable! I did tell Pirate-Husband that I have no idea when I'm going to actually get to knit these. But at least now I have the yarn, right? This entry was posted on Sunday, September 6th, 2009 at 15:51 and is filed under stash, yarn. You can follow any responses to this entry through the RSS 2.0 feed. Both comments and pings are currently closed. Also you sold that green stuff, doesn't that mean you can buy yarn now?